Video – click to watch instead of reading. If you had a court date for a traffic or misdemeanor case in Virginia and you failed to appear, then we need to talk about your situation. You may be facing a Virginia capias warrant, also known as a bench warrant, for failure to appear in court. If you’re lucky, you’ll just have a show cause for failing to appear, but either way, you may be in even more trouble at this point. If you have a case where you’re facing actual jail time in court such as a DUI, a driving on suspended, a possession of marijuana, and even some forms of reckless driving, and you don’t go to your court date, the remedy for that normally is for the judge to issue a bench warrant for your arrest; it’s a capias warrant for failure to appear in court. 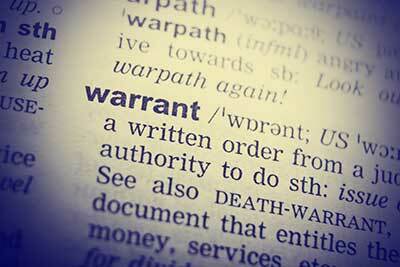 What happens after a capias warrant is issued in Virginia? What a Virginia capias warrant means is that any officer who can find you is going to have the power to arrest you and take you to jail. Then take you in front of the judge for arraignment on the capias and then also to answer for the underlying charge for whatever you missed the court date for originally. If you failed to appear at court and a capias warrant was issued, you may be facing two misdemeanors instead of just the original charge, and in some cases, judges actually do send people to jail for not coming to court. What should you do about failure to appear in Virginia? The best thing to do is to talk with an attorney right away. If it’s still the same day that you’re supposed to be in court and you simply didn’t have a ride or your transportation broke down, you should definitely call the court as well. In some courts, if you can get yourself to the courthouse before the close of business on the same day, the judge may withdraw that bench warrant and might convert it to a show cause or may simply continue the case to another day for a hearing. You’ll still probably have to answer for why you weren’t there on time; however, it can make the situation better if you show up to court on the same day you were supposed to be there. What if the court date was a while ago and you’re just now realizing that you missed it? In a situation where you missed court more than a day ago, that’s where you definitely need to call me. We can discuss your situation and what you’re really looking at. If you have an explanation for why you weren’t in court, you definitely should gather paperwork or witnesses about what happened. For example, if you were in the hospital, then we may have a really good argument if the paperwork show you were there during your required court appearance. We’ll want to bring copies of that to show the judge. If you have a capias warrant, you’ll need to have that served on you, and it’s best if you can turn yourself in on the capias instead of being arrested when it’s inconvenient and perhaps very embarrassing. This is another thing that I can help you with, and I know the courts around Fredericksburg, Spotsylvania and Stafford. If you call me, we can hopefully arrange a good time for the court and you to turn yourself in. In some cases, it may be where you get arraigned on the capias that very day and the judge just sets a new court date for all your charges. Basically, he can make it a little more convenient experience and hopefully you won’t have to worry about posting bond with a bondsman. Also, turning yourself in does look good. When you answer for the capias in court on the trial date, you’re going to be able to show the judge that you really are trying to be responsive to the court and once you’ve learned about the problem, you took action quickly and then turned yourself in voluntarily on the capias. The important thing to remember is that capias or a show cause certainly has ramifications. If you’re found guilty of failing to appear in court, the judge can give you jail time so it is definitely a situation where you want give me a call so we can see what I can do for you, and I can help advise you about possible jail time. If you’re facing a capias for failure to appear or not showing up in court, give me a call today so we can begin discussing the logistics and the possible outcome. What do you do if you fail to appear for court in Virginia. Let me give you some answers. Hi, I’m Andrew Flusche, I’m your Virginia defense attorney and one question that I get quite often is someone calling in saying, “Hey, I missed my court date, what do I do now?” The answer is that it’s going to depend upon the type of case you were facing and the stage that your case is at, but you’re definitely smart to be contacting a traffic attorney or defense attorney. What I always recommend is if you miss court, the first call you should be making is obviously to the court to see what they tell you to do, because sometimes if you miss court and you call later that day, they might can get you into court that day and maybe try to make the case a little smoother and not have really bad ramifications for being late essentially. If you’ve talked to the court and they’re not very helpful or they just tell you to call an attorney, you should definitely call an attorney next to figure out what you’re looking at. If you missed court and you’re charged with simply a speeding ticket or some kind of other traffic ticket that you could have just paid in advanced, likely what has happened at this point is the judge has now found you guilty of that offense and you’re going to get a bill in the mail. The good news is that you do have the right to request a new hearing from the same judge, so you can do what’s called a motion to reopen the case or you can actually just appeal the case. You have 10 days to appeal the case and you get a brand new trial in the circuit court, so you have a different judge, but you have a brand new trial. That’s something we can definitely talk about. If you are facing an offense where there’s possible jail time, such as some times of reckless driving, DUI, marijuana, shoplifting, a lot of cases like that where there is possible jail time on the table, the judge may have found you guilty in your absence, depending on the fact, but he also may have actually issued a show cause, which is a paper basically or a need to appear and explain why you didn’t show up or he could have issues a Capias, which is a bench warrant for your arrest. This is why you should definitely contact the court first to see what papers may be coming for you or if you may be getting a visit from a deputy to actually arrest you. If that’s the case, what you want to do in my opinion, is normally to turn yourself in as soon as possible. That shows good faith to the judge. That shows that it may have been just a mistake and you messed up the calendar or you had car trouble or whatnot. It also helps expedite the process to get the case back on track. As you can see, there’s a lot of different scenarios about what you could have been charged with and then of course, what the judge might do if you missed court. If you fail to appear in court in Virginia, you definitely should contact the court first, then contact a local experienced defense counsel like myself and I’m happy to help you try to figure out what we can do to get the case back on track and try to minimize the damage, and then of course help you try to address the original charge itself and put on the best defense we can. Contact me if you need help for missing court in Virginia. My name is Andrew Flusche. I am a traffic and misdemeanor defense lawyer in Virginia. I limit my practice to traffic tickets and misdemeanor defense, so I know the ins and outs of these offenses. I literally wrote the book on reckless driving in Virginia which you can get on Amazon here or download for free here. I opened my practice in 2008 after earning my Juris Doctor degree from the University of Virginia School of Law. Since then I have earned over 600 5-star reviews from happy clients on Google, Yelp, Facebook, and Avvo. If you’ve been charged with a misdemeanor offense in Virginia, please don’t hesitate to contact me. Your initial consultation is always free, and you'll talk directly with me about the details of your case. I wrote the book on reckless driving. 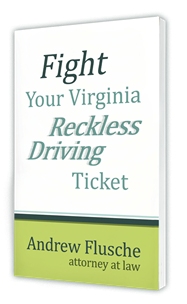 It’s the highest-rated Virginia reckless driving resource on Amazon.com. I wrote the book on DWI. It’s jam-packed full of answers for your case. My special report about driving on suspended explains six critical issues to possibly fight in your case. I provide free consultations for traffic tickets and misdemeanors in my area. If I can't help, I'll do my best to connect you with someone who can. [VIDEO] Can the Police Do That? What is Delayed Reporting in Virginia? I was so satisfied by the clarity Attorney Flusche explained my case before the court that I have listed him as the first call my organization will make if any of my drivers are ever pulled over again in Virginia.—Rev. Nelson E. Copeland, Jr.